These help notes are for the beginner to find simple faults and cure them. It does not cover internal defects in the locomotive mechanism which may require special tools and knowledge. It was originally prepared for members of the Hornby Forum, but generally can be useful to users of other makes. Is this down to the train, the power supply or the track? Using a PP3 9-volt battery touch the locomotive driving wheels so that the +ve terminal touches one side and the -ve terminal touches the other. If the wheels turn the locomotive is probably okay. If the wheels don't turn after cleaning proceed to inspect the locomotive. Look and see if the motor magnet has attracted a pin or staple into the mechanism or between the wheels where it short circuits the pick-ups. 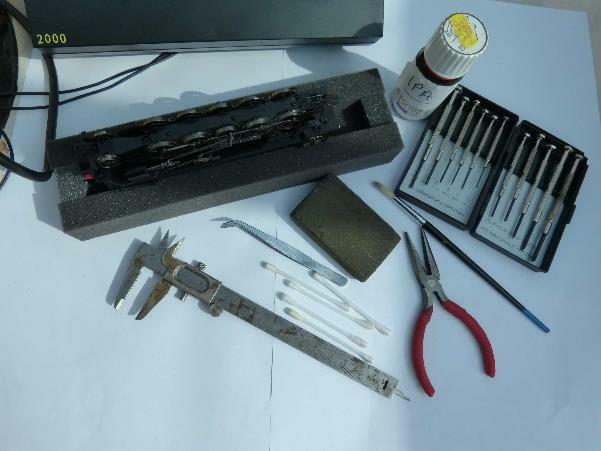 If you see something that looks like it shouldn't be there and it is loose enough to remove, remove it with tweezers, also use tweezers to remove any fluff from inside of the locomotive mechanism. If after cleaning the locomotive still will not run with a PP3 battery you may need to get it looked at by an expert. Next inspect the controller - some simple things first such as making sure the mains plug is working, the fuse is intact and is everything connected as it should be? Many controllers have a light on them to confirm it is working if it is on you need then to look at the connections to the track and the track itself. If you do not have a multi-meter to check you have power from the controller (and not many people have) you can use a 12- volt automotive lamp bulb to test the output. If you can get hold of a small 12v bulb (they sell them in car spares shops) turn the controller on and take the wires that usually connect to the track and touch them on the bulb terminals, does it light? If the bulb doesn’t light check the wires into the controller are tight in the correct output sockets. (controlled DC), try again and if it still will not light, there may be an internal problem with the controller. You may however wish to invest in a track tester from firms such as Train Tech. This useful little device sits across the rails and will light up when power is available. 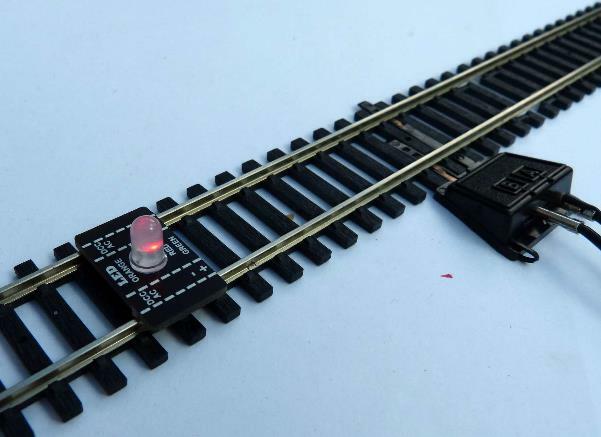 The LED also changes colour from red to green depending upon the polarity which is helpful if you are trying to synchronise two different controllers on adjacent circuits to ensure they are co-ordinated when transferring a train from one circuit to another. If you operate DCC and DC on the same layout (you should never do this at the same time of course) the tester also warns if AC is present, as it will be when using DCC, by glowing orange. It is remotely possible that there may be a break in the track connecting wire. If you have a spare, try swapping them over. You cannot repair a controller yourself. The cheaper ones are probably not worth repairing and should be replaced with a new one, but a more expensive one should be returned to the service department of the supplier. If both the locomotive and controller work you are left with the track. The place where the wires are attached to the track may be defective. If your locomotive and your controller are both working you need to check the connections to the track. Final check. - Support the locomotive upside down. Turn the controller on and touch the wheels on one side with the metal part of the supply wire and the wheels on the other side with the other wire. The wheels should turn. If not, you may need to start all over again. While you have the locomotive upside down you can use the cotton bud dampened with IPA as you make the wheels turn to clean off the dirt. If the wheels are very dirty you may need to use a number of cotton buds. With the train on the track and the controller turned on, touch the top each rail separately but simultaneously with the wires from the controller. If the train responds the problem may be with the connecting rail or power clip. You may need to replace the connecting rail or clip. 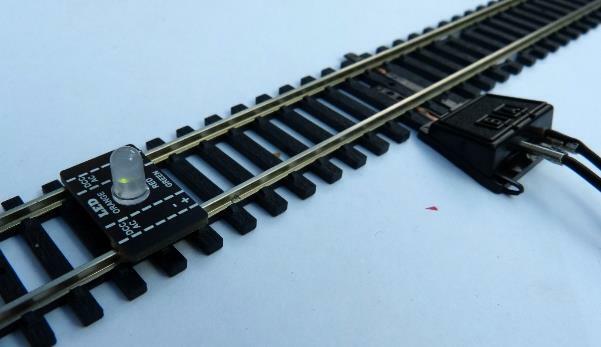 Spare power clips are reasonably cheap and can be purchased from Hornby. These are pushed under the rails at places in the track where slots are moulded into the web that joins the sleepers. These are not too easy to see but the picture below will give a clue to where to look for them. 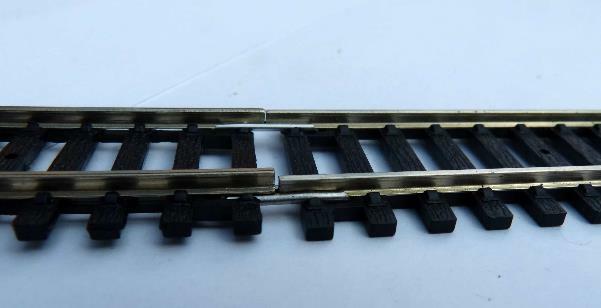 NB This only applies to Hornby rails, Peco track base does not include these slots. Other means of connecting the rails to the controller may be tried. Wires soldered to rail joiners may be purchased and substituted for the original wire. These replace rail joiners between two track pieces. If you are comfortable with soldering the feed wires can be soldered directly to the side or underside of the rails, but make sure that they do not obstruct the passage of the train wheels. The rail head will occasionally get dirty, dust may accumulate on the rails and moisture in the air may have turned this into gunge. A soft fluff free cloth moistened with a little IPA can be used to clean the rail tops. A rectangle of hardboard approx. 3cm x 6cm fluffy side downwards can be a very effective dirt remover, off cuts of hardboard are useful to keep for this purpose. 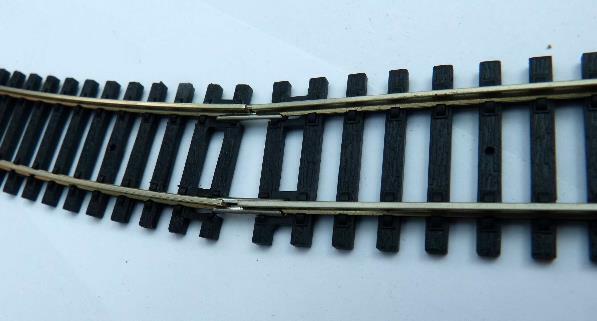 Track rubbers sold by Hornby can also be used but should be used sparingly because they are abrasive. A green kitchen washing up scouring sponge can also be used to remove stubborn dirt, but only use a dry one. Don't use sandpaper or emery cloth to clean the track. It scratches on the rail surface and this will attract dirt. Are the rail joiners tight? All rail joiners (also called fishplates) must be gripping the rails on both track pieces, and fitting snugly around the foot of both rails. Firstly, make sure the rail joiners are correctly located. With the track pieces joined you should not feel any bump or ridge when you stroke your finger across the joint. 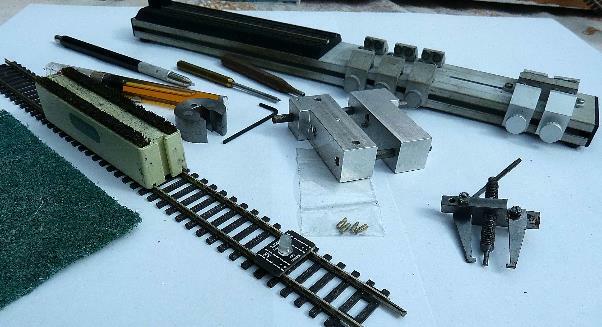 With regular dismantling and remaking a layout the rail joiners may become loose and may reduce the capability to transmit current. With both track pieces joined and pushed together a gentle squeeze on the rail joiners with narrow nosed pliers will help to improve the grip. It is not however a good idea to squeeze the rail joiner when there isn’t a rail inside it as it may distort and then be difficult to re-make the joint. You need to check that there isn't something of metal bridging across between the two rails, a staple or a pin perhaps. Pay particular attention to points where rails of different polarity are closer together. A small magnet can sometimes be useful at finding stray pins on the track. Certain track layouts can cause complications. A Return loop where the track turns back on itself at the same set of points will set up a short circuit. 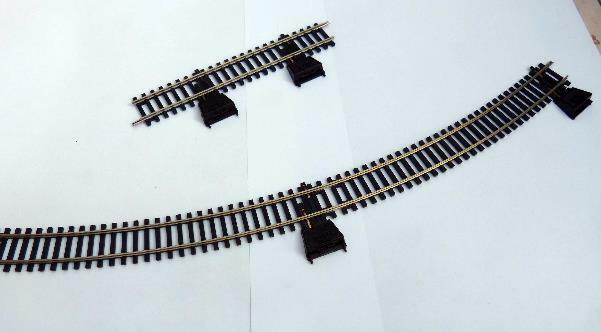 If you wish this type of layout you need to incorporate insulated sections on the loop and switching so that the polarity can be reversed while the train is stopped on the loop. It is usually best to avoid such situations. Using two controllers usually work fine, but if the track sections that they supply is connected by points care has to be exercised when the points are changed to move from one section to the other. It is usually good practice to replace the rail joiners at the place where the sections join with insulated rail joiners. If not on a flat and level surface rails (especially at curves) may twist, so that wheels will not always be on the rails at the same time. This will result in derailment. Track performs much better when the rails are pinned to a flat level board. It is especially necessary that points are laid flat. Badly made joints between rail pieces will cause derailment. If the rail joiner is not firmly holding both rail feet and the ends of both rails are touching there will be a gap or obstacle into which wheels may bump as the pass over and a derailment becomes much more likely. Feel the surface of both rails at the joint with your finger tip. If you clearly feel the joint it is wrong. Remake it. The rails on adjacent track pieces should be aligned to avoid ‘dog-legs’. Trouble can be incurred if there is an angle between adjacent pieces. Check by eye when you lay the track that both pieces are correctly lined up. Extraneous objects on the track may cause a derailment. Keep the track clear of obstructions. Between the switch blades of points is especially vulnerable. Regular inspection is essential. Vehicle wheels which are not properly aligned will cause derailments. Modern vehicles use pin-point bearings running in depressions inside the axle-guards. A vehicle which has been roughly handled or dropped may have the pin-points displaced. Inspect and if necessary adjust the wheel set by easing the axle-guard apart and re-seat the pin-point axles. Modern ‘00’ wheels should normally be 14.5mm between inside faces and if narrower (or wider*) will lead to derailments, especially at turnouts (points). 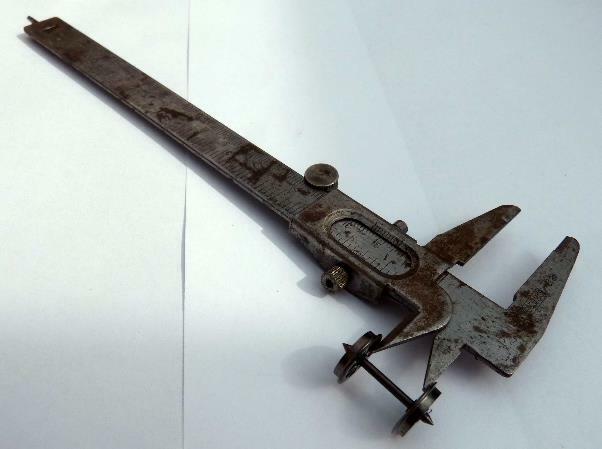 It is possible to buy a special gauge to measure this, but it is perfectly possible to use a cheap Vernier gauge instead. Wheels found to be out of adjustment can usually be adjusted by gently sliding them on the axle. Locomotive driving wheels should only be tackled by experienced modellers. 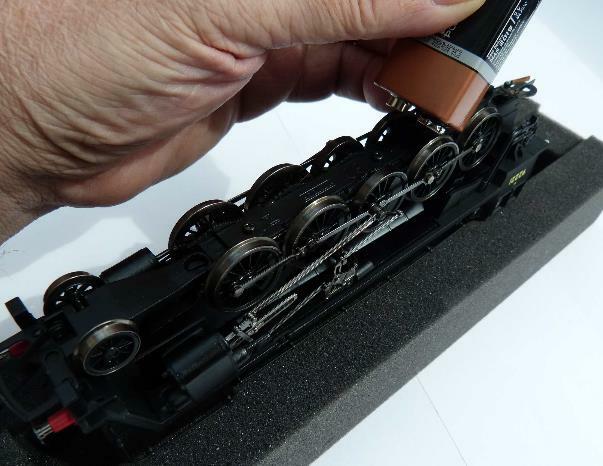 * Specialist finescale modellers may use up to 14.85mm which is not recommended for proprietary rolling stock. More on Back-to-Backs may be found on this website under Wheel-Rail Interface. 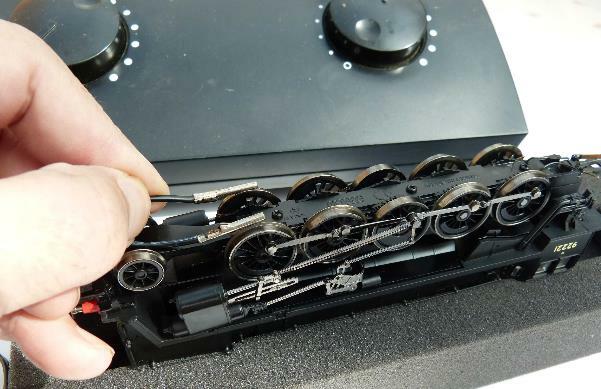 Probably not too likely on proprietary items, but kit built or scratch built rolling stock may have a twist in the chassis which means the wheels are not all in line. A good way to check this is to place the vehicle on a sheet of plate glass and see if the vehicle will rock. A source of plate glass may be a small smooth glass chopping board purchased from a Pound shop or similar. Model railway vehicles and locomotives will need lubrication occasionally BUT only a very small amount. As a rule of thumb if you can see the oil you have put on too much! The recommended method is to dip a pin or an unwound paper clip held in a cork into the bottle of oil and touch the bearing to be lubricated with the end of the pin. One touch is usually enough. Any visible excess needs to be wiped off with tissue. Also avoid getting it on plastic or painted parts. There are special model railway oils available and these must be used in preference to any other. NEVER use WD40, motor oil or any other mineral oils as these will attack and damage plastic, and frequently form heavy sticky gunge. A service cradle can also be most useful. More specialist tools and equipment are shown below, these include wheel quartering tool, wheel puller, rolling road (useful for running-in and testing) back-to back gauge, special wheel spanners, oiler, and track tester. However, most of these will not be essential to a beginner.